Just like any other complex mechanical device, a garage door opener can occasionally malfunction, which can present a risk to you, your family and your property. Our skilled technicians are here to keep your opener functioning properly, and we can also repair it when it breaks. Which Type Is The Right One For You? The type of opener that's going to be best suited for your needs depends on a number of factors. The weight of your door, your budget limitations, and the additional features you require all must be taken into account. There are a lot of different brands and models that you can choose from, but the main decision will come down to the type of drive system that's the best one for your needs. 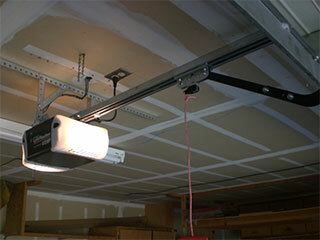 If you are looking for a low priced garage door opener, then a chain drive unit is probably your best bet. It can get a bit noisy, however, and would be annoying to have close to a bedroom. If you want a less noisy opener, then you're better off choosing a belt drive model. Belt drives are more expensive than chain drives, but they are reliable and a lot quitter. The screw-drive option is the fastest of the three, and openers that use this type of drive-system require very little maintenance. This type of unit isn't silent, though, and can be affected by temperature shifts. How Do You Choose The Brand? Security features are essential considerations when thinking about getting a new garage door opener. Some of our best models from Genie and LiftMaster, for example, use rolling code technology, which makes them change the access codes every time you use the device. This makes it almost impossible for your opener to get code-jacked. Our experts will be happy to advise you on the different benefits that each model and brand can offer you and make sure that you're able to make an informed decision. The average residential garage door opens and closes hundreds, if not thousands of times a year. Therefore, it's essential that your opener is able to function properly, and if something was to go wrong, it's imperative that the problem gets resolved as quickly as possible. Our team specializes in replacing motor gears and circuit boards, as well as testing safety sensor alignment and making sure that the door can properly reverse when it needs to. If it's an emergency situation, contact our team at Garage Door Repair Sacramento and let our experts come to your rescue. If you'd like us to help you choose a new model and then install it for you, we'd be happy to do that too.